Coconut oil has been used for thousands of years for its bacteria-fighting properties. Made from mostly pure water, coconut oil, and aloe vera, this dental hygiene duo was developed by two dentists—with over 65 years combined experience—looking for an effective but fluoride-free alternative for daily oral care. Coconut oil has been used for thousands of years for its bacteria-fighting properties, while aloe vera has been clinically proven to fight both plaque and periodontal disease. Use these two in tandem for a bright, beautiful smile. Made in Arizona. Set of 2: Mouthwash 12 Fl.oz; Toothpaste 4 oz. Do not expose to extreme temperature changes. Love this product. Would definitely buy it again! 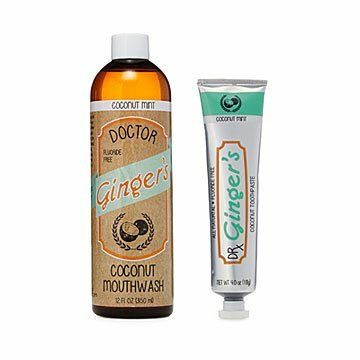 This product is awesome as it cleans my teeth & then gargle with the coconut mouthwash which leaves my mouth with a fresh minty coconut finish. I'm definitely going to buy this again! Oh and did I mention "no fluoride!